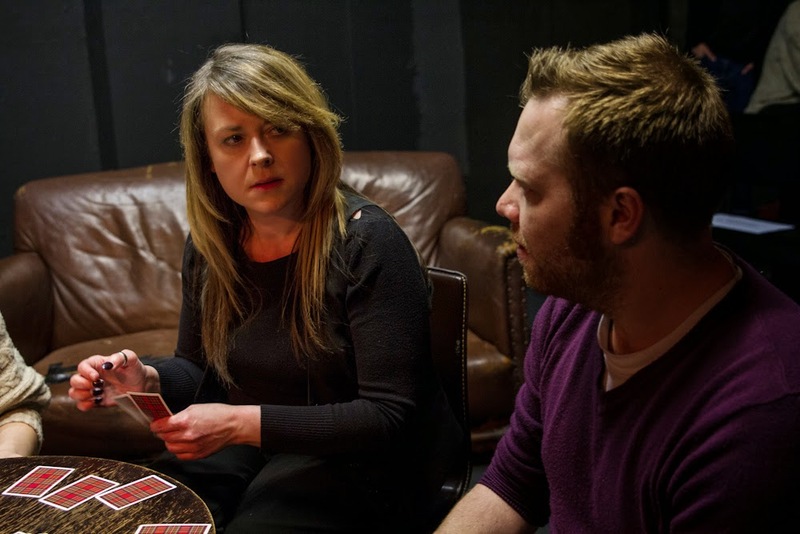 Past Collaborators is a feature where I look back at some of the performers I've worked with over the years, with an update of what they are doing now. Michael Keane is an actor and improv artist from Westmeath who I've a great relationship with, knowing him from London Comedy Writers, as a guest on my podcast, and a friend. New footage found of C.L.G. (Cúmann Luthchleas Gael) from 2014! It's great finding footage of your old work that you didn't know existed, an unexpected blast from the past! An audience member from the White Bear sent me this a few weeks ago - the full play of C.L.G. from the 2014 run. 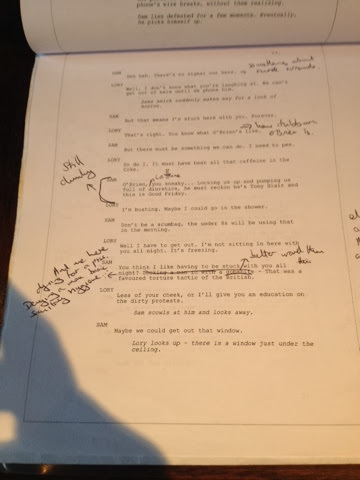 I remember Paul Rogers taking one look at the script and just getting it immediately - completely putting to bed any anxiety I had about the fact that the character is written for a much older actor. Paul was great to work with and is now training to be a wrestler - I can't wait to see him in action! He's just decided on a finishing move, so I'll keep you posted when he's laying the smackdown in a ring near you! I've decided to follow this up with footage of some of my other old work - no matter how good or bad it is! So if you have any footage or photographs of work I've been in, please do get in touch! ★★★★★ Five star review in The Irish World! 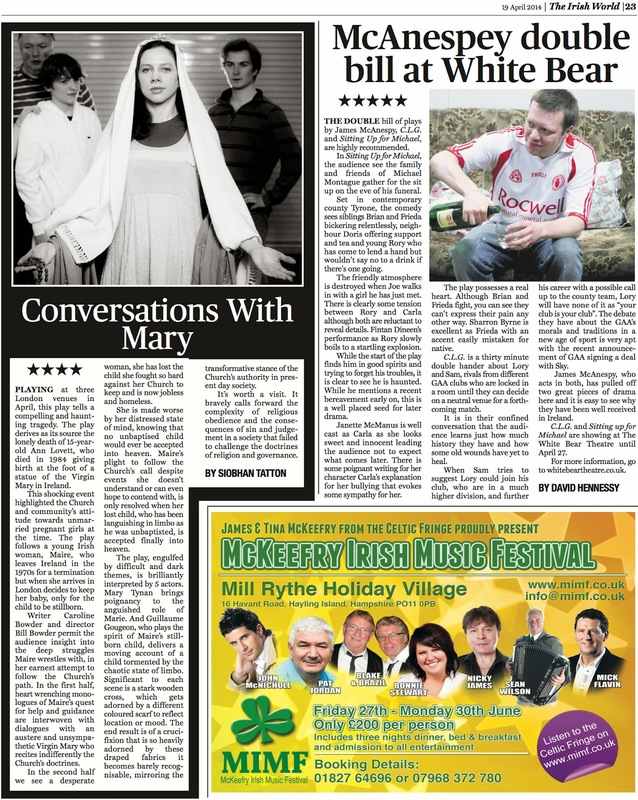 Today's Irish World features a five star review for C.L.G./Sitting Up for Michael in it's print edition. Obviously we are all delighted, and congratulations in particular must go to Sharron Byrne, Janette McManus and Fintan Dineen who were singled out for praise! Make sure you don't miss out on this Five Star show! Book your tickets now! C.L.G./Sitting Up for Michael Double Bill is debuting in the White Bear Theatre, London from April 8-27. Tickets are on sale now from TicketSource. First review for C.L.G./Sitting Up for Michael is in! ★★★★ Four stars from Remote Goat! Our first review of C.L.G./Sitting Up for Michael is in! 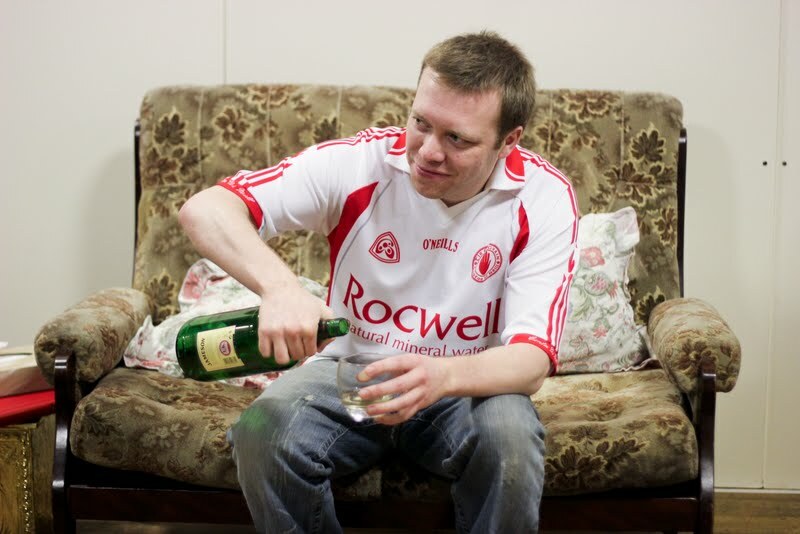 Remote Goat has given our production 4 stars, and particularly commended the performances of Sharron Byrne as Frieda and Peter Dineen as Billy. Sharron Byrne in her lauded performance as Frieda. They particularly enjoyed the frantic pace and "very funny" writing in C.L.G., which has never been viewed by an audience before. The cast and crew of C.L.G./Sitting Up for Michael discuss the upcoming double bill. Two members of rival GAA clubs have been locked in a room until they can decide on a neutral venue for their upcoming match. It'll be the first time the two teams will have met for nine years, and some old scores have been long to heal. Will the dastardly Sam trick his way to getting the venue he wants, or can the put-upon Lory hold fast? They'd need to hurry up though - Fair City will be on soon. Michael's died. Who's going to do the readings? Will there be a lock-in at Packie's? Why did he only get twenty Mass Cards? It's a wil' handlin' altogether. The family and friends of Michael Montague gather for the sit up on the eve of his funeral. Set in contemporary county Tyrone, James McAnespy's comedy explores themes of family, separation and hidden pasts. So don't open the brandy until tomorrow. Brian, Michael's stubborn son, bickers relentlessly with his sister Frieda who has just come down from Belfast and starts ruling the roost as usual. Their neighbour Doris offers her support and a hot pot of tea. Young Rory, who reaches for a drink a little too readily is there to see Joe, whose coming down on the University bus, with a girl he just met - but she's got more to hide than she's letting on. Over the coming days and weeks, we will be profiling the cast and crew of the C.L.G. / Sitting up for Michael Double Bill. Edit: Due to cast changes, James is now playing the role of Brian in Sitting Up for Michael. Stay tuned for updates on the beard he'll be donning for the role! 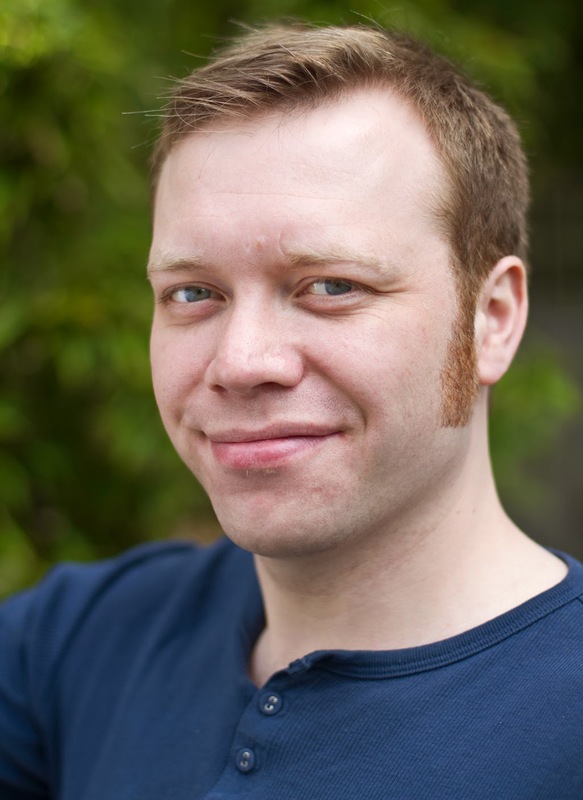 James McAnespy is the artistic director of King's Fool Productions, which he founded in Belfast in 2011. The company's first major project was the debut run of Sitting Up for Michael, which toured across the north of Ireland in 2012, playing to hugely appreciative audiences that averaged over 100 per night. He has not relocated himself and the company to London and will be reviving 'SUFM' with a brand new play, C.L.G., which debuts in the White Bear Theatre. 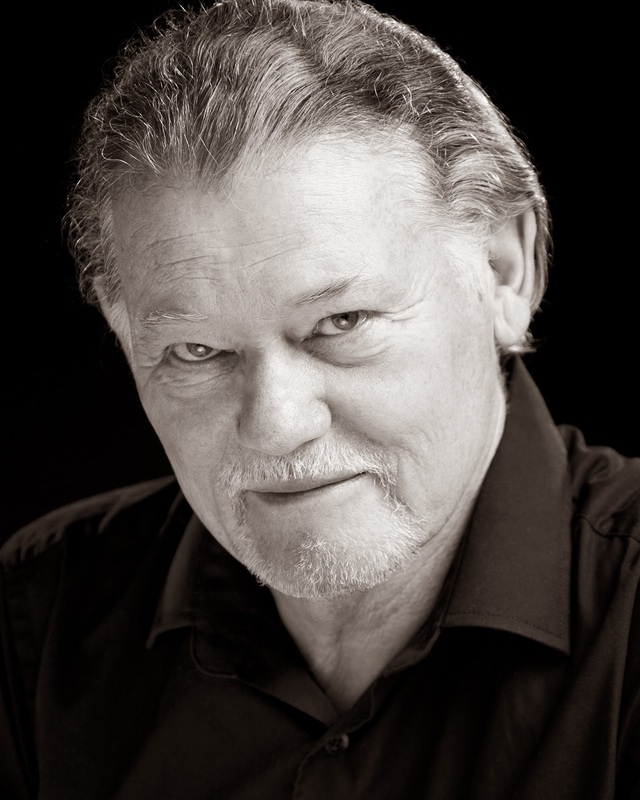 As an actor, James has enjoyed the limelight as the lead role in a vast array of productions in Belfast. In 2010, his first major stage performance was the top billed role in the Irish premier of Arthur Miller's tense holocaust drama, Incident at Vichy. His performance attracted rave reviews, with The Virtual Methodist singling him out as "the stand-out performance." He continued this rich vein of form through 2011, with lead roles in performances of Stumpergasse 31 (where he played a young Adolf Hitler) and Robots in Disguise, with TheatreWatch lauding "suave, spiteful little lucifer of a character [who] was horrifically believable". He also made his screen debut in Éalú, playing the role of the true-life criminal Sean Bourke, who masterminded a communist prison break from Wormwood scrubs. Also that year, he debuted as the voice of UTV Weather's sponsors, Progressive Building Society, reaching half a million people on a nightly basis. In 2012, as well as acting in the hugely popular run of Sitting Up for Michael, he performed in The Odd Couple at the Cathedral Quarter Arts Festival, and was co-lead in the premier of Dave Kinghan's claustrophobic art drama, Intervention at the Pick N Mix festival at Belfast's world-class MAC. In 2013, he established himself in London and across Britain with his recurring role as Dougal in Laughlines' Father Ted tribute show, Ted & Co, selling out months ahead of production.